The general election contest between Obama and Romney has changed little over the past few months. Currently, 50% of registered voters support Obama or lean more toward him, while 43% back Romney or lean toward him. 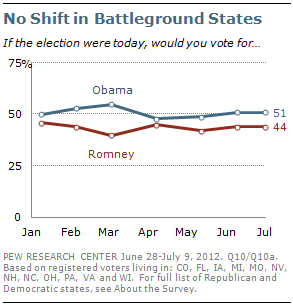 In June (June 7-17), Obama held a slight four-point edge (50% to 46%) and in May, Obama led 49% to 42%. Similarly, the preferences of key groups of voters have remained fairly stable. Independents are evenly divided (46% Obama vs. 45% Romney), which is little changed from last month (49% Romney vs. 44% Obama). Obama continues to hold wide leads among blacks, Hispanics, women, college graduates and younger voters. Romney continues to hold a double-digit lead (currently 54% to 40%) among whites. As has been the case throughout this year, Romney’s advantage is particularly strong among working-class whites – he leads by a 58% to 35% margin among whites without a college degree, while white college graduates are divided (50% Obama, 47% Romney). (For trends in the race among selected demographic groups, see “Presidential Race Among Key Groups”). Despite a steep increase in campaign advertising and other campaign activities in many key battleground states over the past month, there has been no shift in voter preferences. Currently, Obama holds a slim 51% to 44% margin among voters in 12 of the most competitive states. This is identical to the balance of support in these states in June. 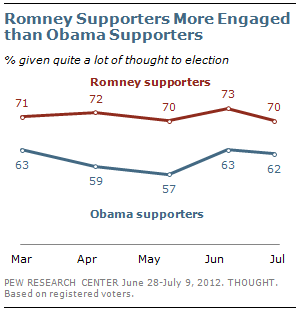 Romney continues to hold an engagement advantage over Obama in the presidential race. Currently, 70% of Romney voters say they have given quite a lot of thought to the election, compared with 62% of Obama supporters. The GOP’s lead on voter engagement has held fairly steady over the past several months. Four years ago, by contrast, the Democrats either led or ran about even with the GOP on most engagement measures. In June 2008, 75% of Obama supporters and 73% of the supporters of John McCain said they had given quite a lot of thought to the election. (For more, see “GOP Holds Early Turnout Edge, But Little Enthusiasm for Romney,” June 21, 2012). Obama holds wide leads over Romney on several issues, including dealing with the problems of the poor (by 30 points), reflecting people’s views on social issues like abortion and gay rights (14 points), defending against terrorist attacks (12 points) and dealing with the nation’s energy problems (12 points). Voters’ evaluations are more divided on the issues that are at the top of their agenda – improving economic conditions and the job situation. And Romney leads by a wide margin as the candidate best able to reduce the federal budget deficit (50% Romney vs. 36% Obama). Last month, Romney led Obama on improving economic conditions by 49% to 41%. But today Obama holds a 48% to 42% edge. 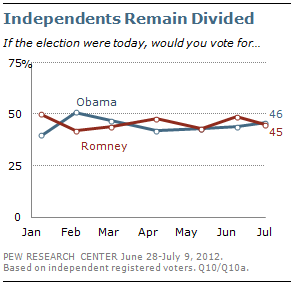 Romney has lost significant ground on the economy among independents. 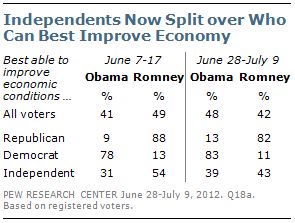 In June, independents favored Romney as the candidate best able to improve economic conditions by a 54%-31% margin. In the current survey, independents are divided: 43% say Romney can best improve economic conditions, compared with 39% who say Obama. And while voters were evenly divided last month over whether Obama (45%) or Romney (44%) could best deal with health care, today Obama holds an eight-point lead on this issue (49% Obama vs. 41% Romney). Obama runs stronger on foreign policy and national security against Romney than he did against John McCain in 2008. But he does worse on economic issues, especially reducing the budget deficit. In 2008 Obama had a 15-point advantage over McCain as the candidate best able to improve the economy. 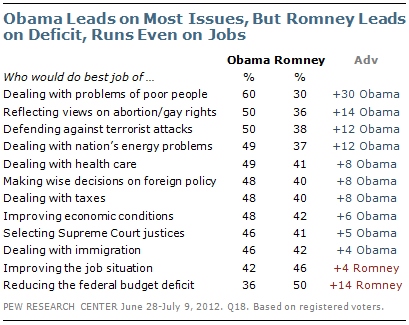 His edge over Romney on this issue is just six points today. And on reducing the budget deficit, Obama’s wide 20-point lead over McCain in 2008 has disappeared and the budget deficit is now Romney’s strongest issue: He leads Obama as the candidate best able to deal with the deficit by a 50%-36% margin. However, Obama leads on dealing with taxes by about the same margin as he did over McCain four years ago (eight points now, 11 points then). McCain led Obama as the candidate best able to defend the country from future terrorist attacks by 15 points in 2008. Today, Obama leads Romney by 12 points on dealing with the terrorist threat. And while Obama and McCain ran about even on making wise foreign policy decisions four years ago, Romney trails Obama by eight points in the current survey. Views of the Republican Party are more negative than they were in 2008. Just 36% of registered voters have a favorable view of the GOP while 59% have an unfavorable view. Four years ago, 44% viewed the Republican Party favorably while 50% expressed an unfavorable opinion. The Democratic Party continues to be viewed more positively than the Republican Party, but not as favorably as it was four years ago. In August 2008, more voters had a favorable than unfavorable opinion of the Democratic Party (56% to 39%). Today, 49% express an unfavorable view of the party while 46% have a favorable opinion. 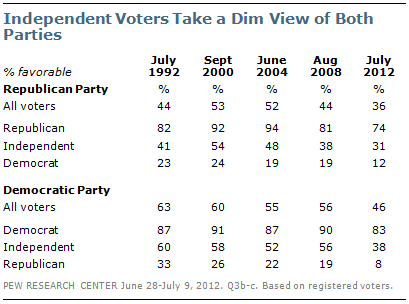 Among independents, views of the Democratic Party that were, on balance, positive in 2008 are now negative. Just 38% of independent voters view the Democratic Party favorably, while 54% have an unfavorable opinion. Four years ago, opinion was nearly reversed; 56% had a favorable view while 38% had an unfavorable view. Opinion of the Republican Party among independent voters also has grown more negative since 2008. Today, nearly twice as many independents have an unfavorable than favorable view of the Republican Party (61% to 31%). Roughly three-quarters of Republican voters (74%) have a favorable view of their party, the lowest percentage in recent election cycles. In August 2008, 81% of GOP voters had a favorable view of their party, and in 2004 and 2000, more than 90% expressed favorable views. Democratic voters also have a less favorable view of their party than they did four years ago (83% today, 90% in August 2008). And partisans view the opposing party less favorably than in the past. Just 8% of Republican voters have a favorable opinion of the Democratic Party, down from 19% in 2008 and 22% in 2004. And just 12% of Democrats view the GOP favorably. At comparable points in the past two campaigns, 19% of Democrats expressed favorable opinions of the Republican Party.